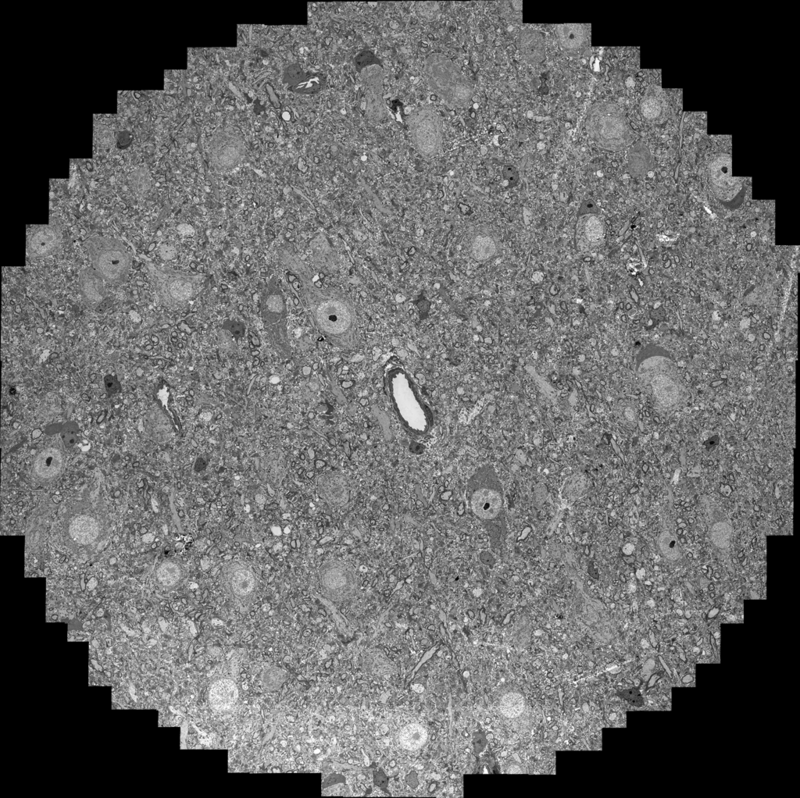 Retinal Connectome dataset RC1 slice 001 visualized by TEM. This is a horizontal TEM plane through the retinal inner nuclear layer composed of over 1000 individual TEM images automatically captured as described in Anderson et al. 2009 (PLoS Biol 7, e1000074) on a JEOL JEM 1400 using a Gatan UltraScan 4000 camera. The center of a canonical field 243 μm in diameter was identified in the slot grid using SerialEM (D. N. Mastronarde 2006 , J Struct Biol 152: 32), and captured as an array of image tiles at 950-1100 tiles/section and 2.18 nm/pixel resolution. Each tile has 15% area overlap with its neighbors. Image mosaics and volumes were generated using the NCR Toolset (http://www.sci.utah.edu/download/ncrtoolset). SerialEM metadata position information used by the NCR Toolset application ir-translate produces precise initial image mosaics that are refined by ir-refine-grid to correct for image aberrations. 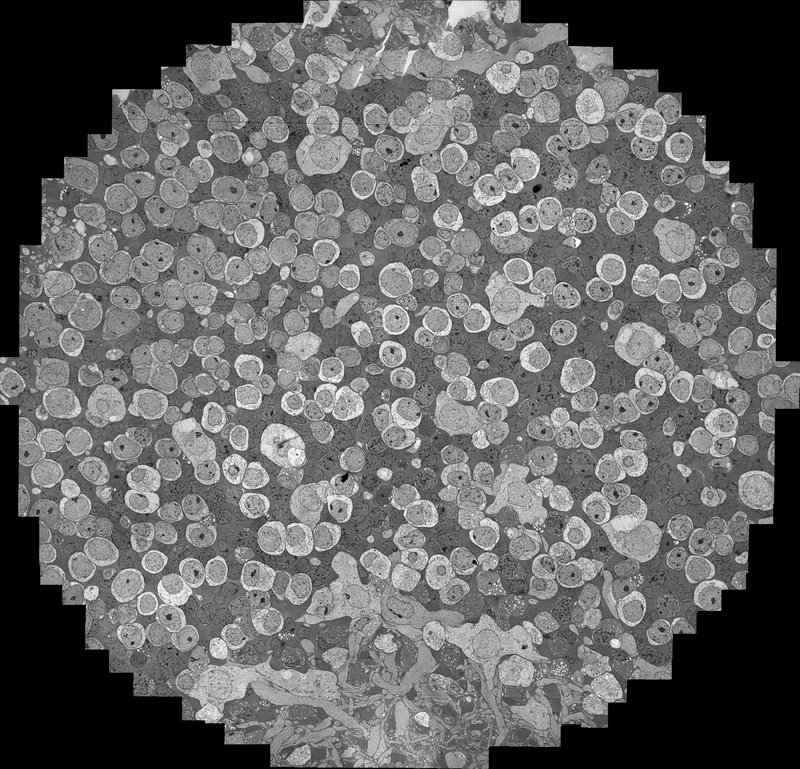 Slice-to-slice TEM image registration is automated by ir-stos-brute, ir-stos-grid. CMP-to-TEM registrations are operator-guided with ir-tweak. 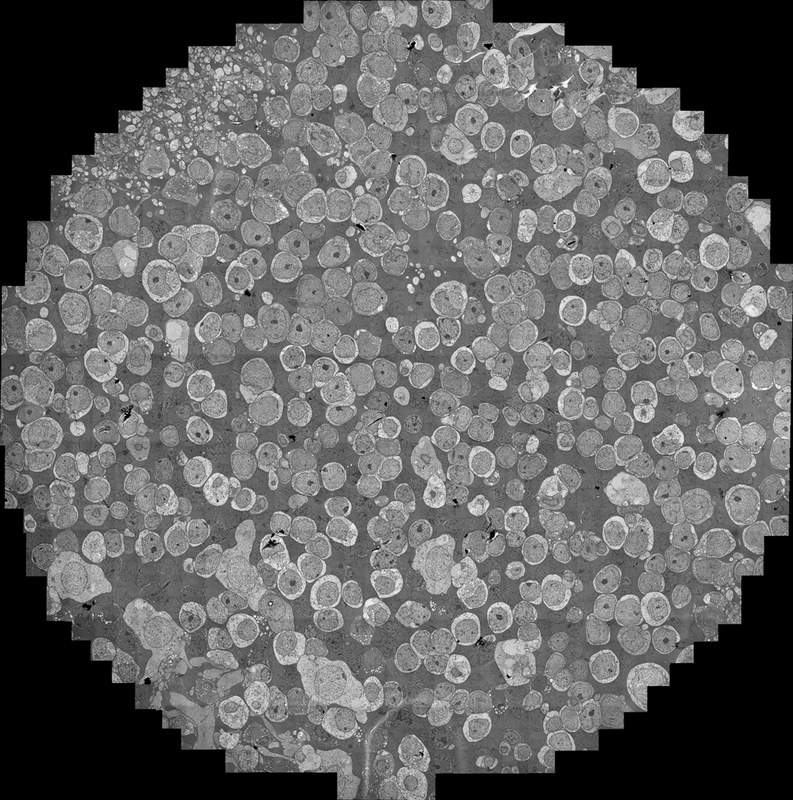 Small 1024 x 1024 screen version of RC1 0033 downsampled to 1.2 Mb compressed Retinal Connectome dataset RC1 slice 030 visualized by TEM. Small RC1 00174 Quicktime ® Movie of step-through series Right-click or control-click to download 1 Mb. Large 1024×768 RC1 00174 Quicktime ® Movie of step-through series Right-click or control-click to download 17 Mb.